I’ve been meaning to get our of my local dining rut. Which isn’t so much of a rut as a predilection to eating at Vietnamese restaurants when I go out for dinner locally. It’s hard to stop myself from heading for the enticing tastes of fish sauce, chilli and lemongrass. But as those who live in the area, and those who are clued in enough to read Lauren’s Footscray Food Blog know, there’s a lot more to the ‘hood than pho and broken rice. When Mr J agreed to come out West for dinner one Saturday night, I thought I’d take the chance to suggest we hit up one of the African restaurants nearby. Now I use the term African only out of ignorance – I don’t really know much of the intricacies which would distinguish between an Ethiopian or Eritrean restaurant, nor any other country; though these two seem to be the most common in Footscray. I feel a little guilty, as I rankle at the thought of someone referring to a Korean or Thai restaurant as an ‘Asian’ restaurant. I’ll make an effort to educate myself further in these matters soon. Originally, I had thought to go to Adulis, but it’s recently closed – though another restaurant of indeterminate African origin has sprung up in its place – so went to Awash, as it had more people dining there. It’s something of a sheep-like move, but I still get put off eating at restaurants with no patrons in them, unless I’ve been recommended to go there. I avoid places with spruikers on the street in the same way. So we stepped in out of the rain, and were met by bright green walls, the smell of bebere and the happy beats and chanting of the African music playing in the background. There were no staff in sight, so we seated ourselves, and a moment later, an earth-mother type lady came out with menus. The place is pretty small, and I think pretty much just run by a family who work both in the kitchen and front of house. Mr J had never eaten food of any African variety, so he was pretty excited. This was during my Lenten red meat fast, so we ordered the vegetarian combination, and the doro wat – a chicken ‘curry’ – along with two Ethiopian beers to wash it down. Three of the great things about Ethiopian/Eritrean food is that it’s served on injera, it’s a shared meal, and you eat it with your hands. Food’s always more playful and enjoyable when you eat it with your hands, I think. And there’s a sense of bonding that comes with that process. Hence the term ‘to break bread’ with someone. 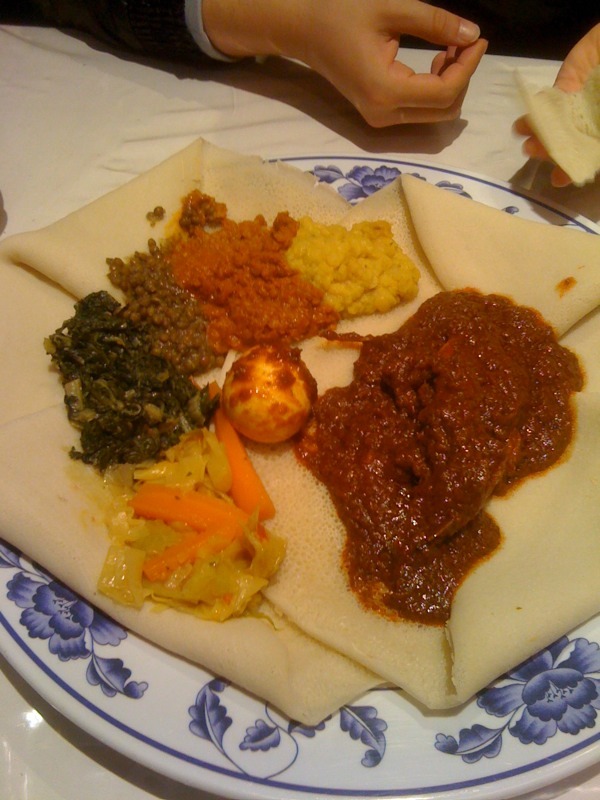 So as long as you’re not too crazily clumsy, Ethiopian is probably a great second date option. Things get a bit messy, especially towards the end, when the injera has soaked up a lot of sauce and starts falling apart in your hands. But it’s a pretty level playing field, so as long as your date has a sense of humour – why are you on a second date if s/he doesn’t – it’s a lot of fun. The various lentils and vegetables were full of flavour, though the heavy use of spices without any real chilli heat is something of a confusing thing to my palate. I’m fairly sure that’s just because I have turned into something of a chilli fiend in the past year or so. There were three different types of lentils, along with a braised kale (or silverbeet) and another dish of carrots and cabbage. My favourite was the kale. The doro wat was also really tasty, though the chicken was a bit dry. 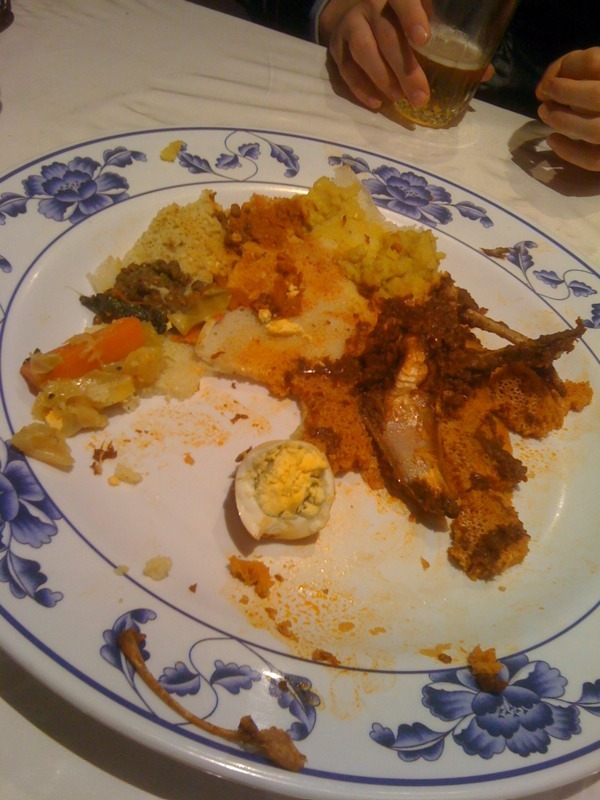 It’s probably not the greatest African food I’ve had, but it was pretty good. All in all, Awash is a great, casual place. Given the nature of the ‘hands on’ eating, I’d only go there with friends, or people I want to get friendly with! God I love injera bread. Overdue for another dose. Like I said earlier this evening Billy, loving the new look of the blog! Yes, love the level playing field! And your great pic of your meal as it got towards the end. We like Awash.